I am most grateful for your Loyal Addresses and the generous words of the Lord Speaker and Mr. Speaker. 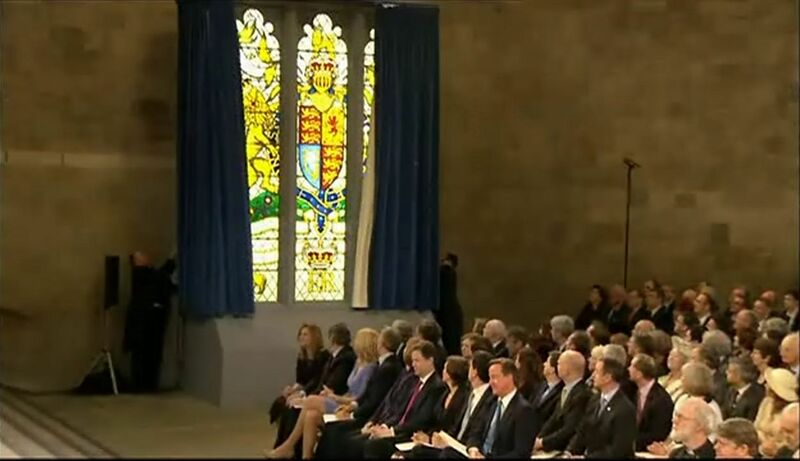 This great institution has been at the heart of the country and the lives of our people throughout its history. 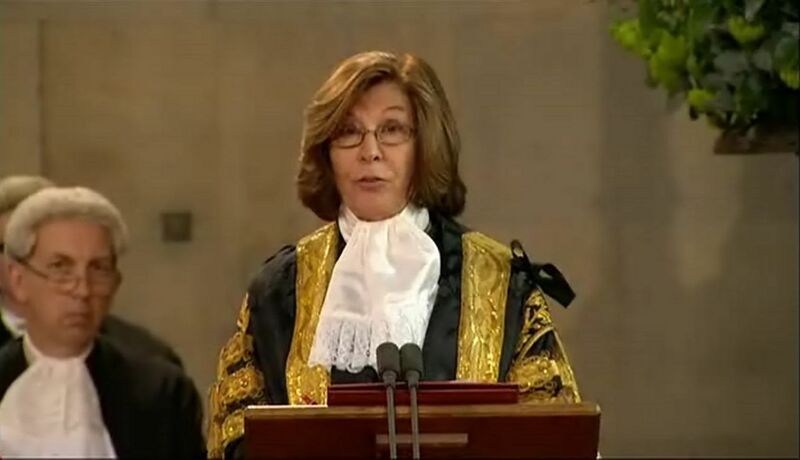 As Parliamentarians, you share with your forebears a fundamental role in the laws and decisions of your own age. Parliament has survived as an unshakeable cornerstone of our constitution and our way of life. History links monarchs and Parliament, a connecting thread from one period to the next. So, in an era when the regular, worthy rhythm of life is less eye-catching than doing something extraordinary, I am reassured that I am merely the second Sovereign to celebrate a Diamond Jubilee. As today, it was my privilege to address you during my Silver and Golden Jubilees. Many of you were present ten years ago and some of you will recall the occasion in 1977. Since my Accession, I have been a regular visitor to the Palace of Westminster and, at the last count, have had the pleasurable duty of treating with twelve Prime Ministers. Over such a period, one can observe that the experience of venerable old age can be a mighty guide but not a prerequisite for success in public office. I am therefore very pleased to be addressing many younger Parliamentarians and also those bringing such a wide range of background and experience to your vital, national work. During these years as your Queen, the support of my family has, across the generations, been beyond measure. Prince Philip is, I believe, well-known for declining compliments of any kind. But throughout he has been a constant strength and guide. He and I are very proud and grateful that The Prince of Wales and other members of our family are travelling on my behalf in this Diamond Jubilee year to visit all the Commonwealth Realms and a number of other Commonwealth countries. These overseas tours are a reminder of our close affinity with the Commonwealth, encompassing about one-third of the world’s population. My own association with the Commonwealth has taught me that the most important contact between nations is usually contact between its peoples. An organisation dedicated to certain values, the Commonwealth has flourished and grown by successfully promoting and protecting that contact. At home, Prince Philip and I will be visiting towns and cities up and down the land. It is my sincere hope that the Diamond Jubilee will be an opportunity for people to come together in a spirit of neighbourliness and celebration of their own communities. We also hope to celebrate the professional and voluntary service given by millions of people across the country who are working for the public good. They are a source of vital support to the welfare and wellbeing of others, often unseen or overlooked. And as we reflect upon public service, let us again be mindful of the remarkable sacrifice and courage of our Armed Forces. Much may indeed have changed these past sixty years but the valour of those who risk their lives for the defence and freedom of us all remains undimmed. The happy relationship I have enjoyed with Parliament has extended well beyond the more than three and a half thousand Bills I have signed into law. I am therefore very touched by the magnificent gift before me, generously subscribed by many of you. Should this beautiful window cause just a little extra colour to shine down upon this ancient place, I should gladly settle for that. We are reminded here of our past, of the continuity of our national story and the virtues of resilience, ingenuity and tolerance which created it. I have been privileged to witness some of that history and, with the support of my family, rededicate myself to the service of our great country and its people now and in the years to come. This was the monarch's sixth address to both Houses of Parliament. She gave similar speeches in celebration of her Golden Jubilee in 2002 and Silver Jubilee 25 years earlier in 1977. The Speakers of both houses lauded the Queen's dedication to her subjects. 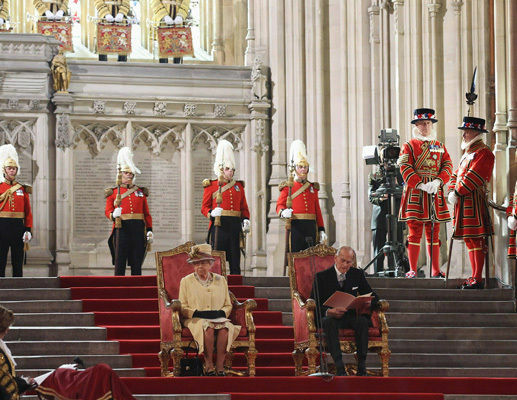 Introducing the Queen ahead of her address to Parliament to mark her Diamond Jubilee, the House of Commons Speaker, John Bercow, praised the monarch for "sixty years of stability. Sixty years of security. Sixty years of certainty. Sixty years of sacrifice. Sixty years of service." The Lord Speaker, Baroness Frances D'Souza of Wychwood in the County of Oxfordshire, who is also President of the Commonwealth Parliamentary Association, stressed the Monarch's dedication the the Commonwealth. We, the Lords Spiritual and Temporal, are assembled here today to celebrate sixty years of Your reign. We record with warmth and affection our appreciation of Your dedicated service to Your people, and Your unequalled sense of public duty over the years - service and duty to which You have only recently, and so movingly, re-dedicated Yourself. We celebrate too Your stewardship of Your high office. You have personified continuity and stability while ensuring that Your role has evolved imperceptibly, with the result that the Monarchy is as integral a part of our national life today as it was 60 years ago. We rejoice in this Jubilee and we give thanks for all that it represents. 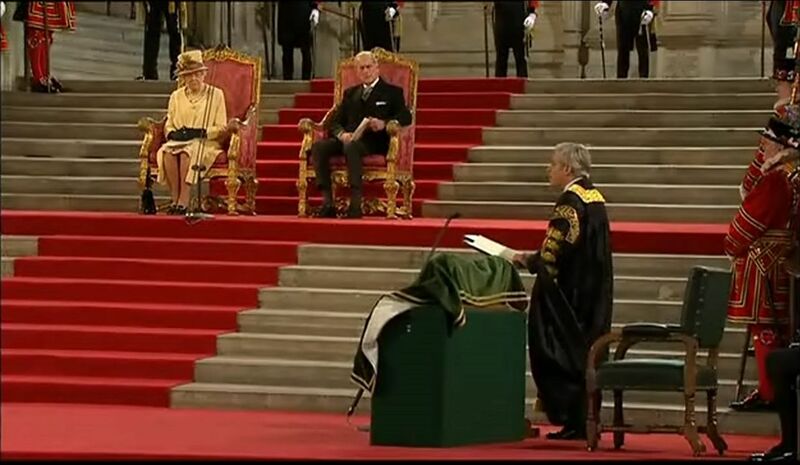 At the same time, we record our gratitude for the support which You have received throughout Your reign from His Royal Highness Prince Philip, for in this year of jubilee we celebrate his service too. This is one of the first of many celebrations to be held up and down the land. In the coming months You and the Duke will travel widely throughout the Kingdom. But today You have come to Parliament, the constitutional heart of the nation, and granted us the privilege of being the first of Your people formally to honour Your Jubilee. 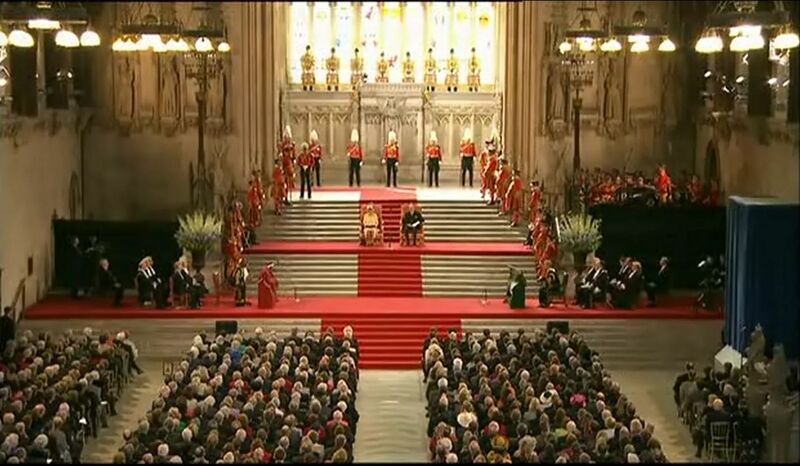 And where better to begin the celebrations than here, in the splendour of Westminster Hall - a hall of kings and queens for almost a millennium. While this Hall has seen many historic events, few are permanently commemorated. 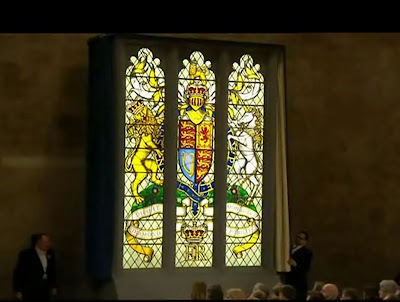 So we look forward with great anticipation to the unveiling of the stained glass window which members of both Houses have commissioned in honour of this day. When placed in the window above the great doors, Your Coat of Arms and Royal Cypher will bathe the Hall in colour and be seen daily by members and staff as they walk through to their offices—and by the many thousands of visitors we receive here weekly, from both home and abroad. 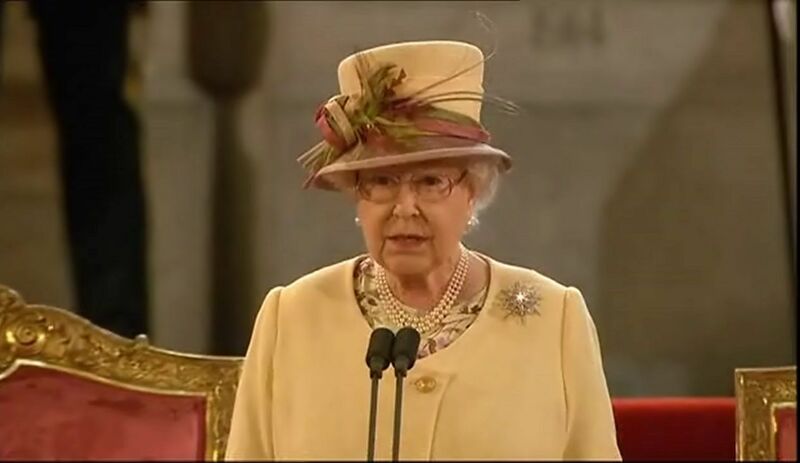 For we must remember that Your Jubilee will be celebrated with joy in Your other realms and territories, and throughout the rest of the Commonwealth. The Commonwealth as we know it today is of course one of the great achievements of Your reign and under Your leadership continues to flourish, with a membership of 54 countries. It is still growing. It is a tremendous force for good in the world and we are aware of its special personal significance to You. Many of us present here today take an active part in the work of the United Kingdom Branch of the Commonwealth Parliamentary Association. We work to share our experiences, to learn from one another, and to promote democracy. 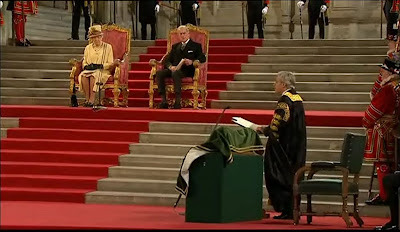 But our efforts are as nothing compared with those of Your Majesty in the service of Your beloved Commonwealth. Over the years You have visited all but two Commonwealth countries—some, many times—and attended all Heads of Government meetings since 1997. We look on with admiration and pride at the triumphs of some of Your recent tours and it is significant that members of the Royal Family are representing You this year at the Jubilee celebrations being held in all those lands in which You are Head of State. Your Majesty, the Lords Spiritual and Temporal in Parliament Assembled give thanks for this Your Diamond Jubilee. We look forward to the years to come and we pray that You and Your realms may enjoy the peace, plenty and prosperity that have so distinguished Your reign. 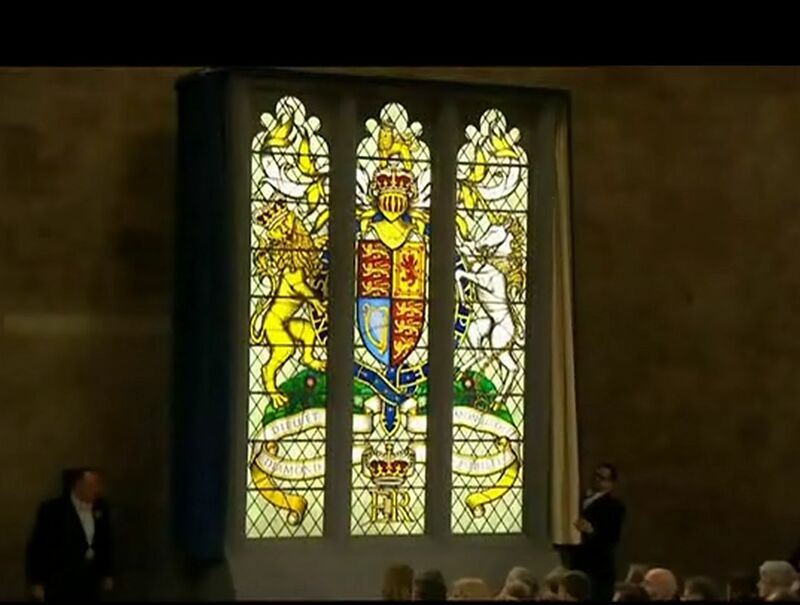 During the event a Diamond Jubilee window - a gift from the members of both Houses - was unveiled to mark the monarch's 60-year reign. It will be installed above the North Door of Westminster Hall later this year.